Rarely anyone dared venture near Maitidevi temple during the day and everyone, except tantriks (shamans), invariably stayed away from the place at night. Dense, thorny bushes separated it from the surrounding houses, and a nearby shamshan ghat (cremation ground)—an ideal—place for invoking the spirits—meant that there would be little human interference. Until the beginning of 20th century, that is, when the Rana Prime Minister Chandra Shamsher erected the current structure in pagoda style like most other Hindu temples in the valley. A glance at the shops and houses nearby, much older in appearance, makes you wonder if the temple was built much later after the residents settled in the area. 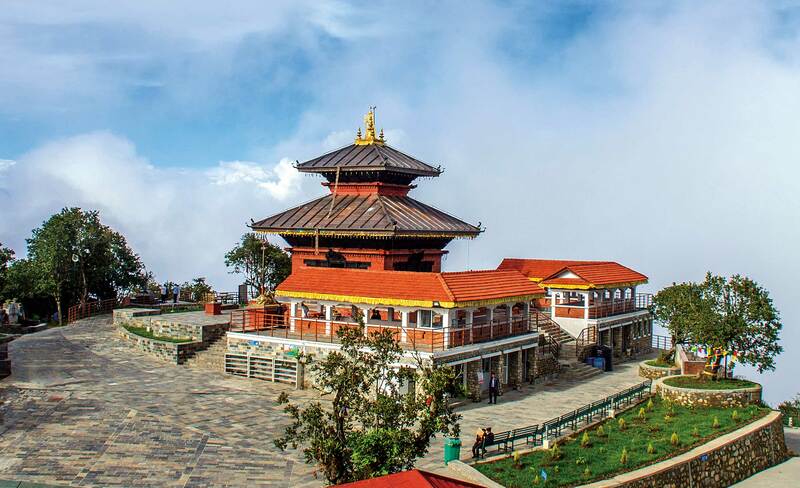 But Tirtha Man Bajracharya, the head priest at the temple says, “The oldest edifice was built in 628 AD by Amshu Verma, a warrior under Lichhavi King Shiva Dev”—fully 13 centuries before Chandra Shamsher. The temple of Maitidevi can be reached going west from Old Baneshwor and turning right before approaching Dillibazaar. The other way is to turn right from Gyaneshwor Chowk crossing. Ask a shop-owner or locals and they’ll guide you. If you are driving your way up to the temple, look out for the traffic as one-way rule is applicable on most roads in the route. Going by the priest’s claim and what you observe of the current structure, its delicate woodwork and metal craft, all you can conjure up of the old days is nothing more than a makeshift place of worship. Nobody knows quite what it looked like at the beginning. The two stone lions guarding the entrance to the sanctum sanctorum, and the huge peepal tree with its expanding branches arching over the temple (a divine architecture, you could say, to shelter the temple from heat and rain) are some of the relics from the time when Amshu Verma built the first temple in 7th century. Similarly, tucked a few feet away on the right hand side of the temple is a crematorium, a small space enclosed within concrete walls, the remains of the ancient cremation ground (the shamshan ghat). Traditions associated with the temple continue to change with each generation, but a few have been going on for ages. During Tihar, the Festival of Lights which falls during October-November, for example, prayer to Laxmi (Goddess of Wealth) is offered at homes only after Maitidevi is worshipped at the temple. The goddess, also revered as Mahalaxmi, has to be reinstituted inside the sanctum sanctorum every year during Laxmi Puja by the Munikars of Maligaon. The Munikars, a Newari caste living in Maligaon on the east edge of Kathmandu city, are the designated caretakers of the goddess. “They offer prayer to the goddess with special flowers called muswon,” says the priest. (Mu implies Munikar and swon means flower.) Until very recently, this flower was grown exclusively by the Munikars. Likewise, before and after going to Manokamana, the popular Temple of Wishes in Gorkha District, people offer jal (sacred water) to Maitidevi for their wishes to materialize. Maitidevi temple, it is said, is parental home of all goddesses. The name of the temple itself is derived from maiti (parental home) and devi (goddess). During Teej festival, therefore, married women pay obeisance to the goddess and gather at the temple to dance and sing. Something women who lived some 1400 years ago, when Amshu Verma first set up the temple, would not have imagined in the worst of their dreams. vicinity of Karunamaya. Following her wish, both the deities were installed in the same temple—Sankata on the top and Karunamaya on the ground floor. Sankata’s temple is ensconced inside a crammed but quiet Tebahal colony adjacent to the crowded and noisy New Road market. 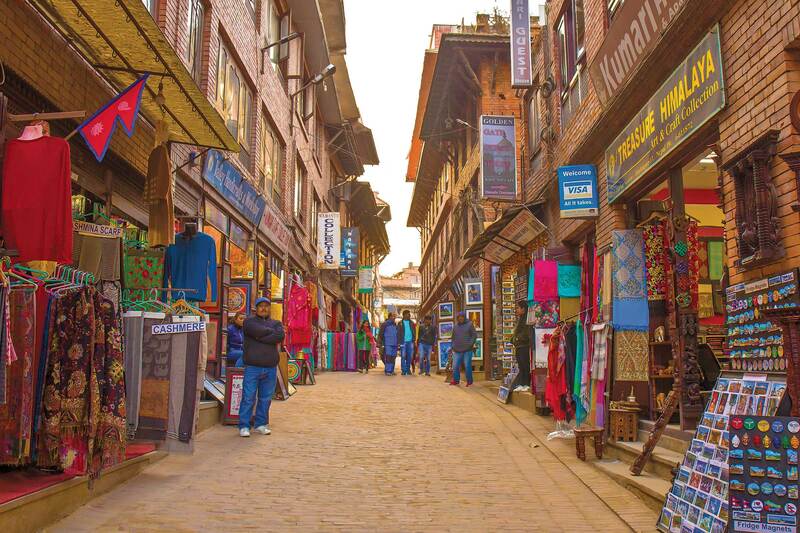 You can pass through any of the alleyways that connect the market and Tebahal colony to enter the temple area. The premise is unfenced with the temple tucked in southern most corner of the large open square bordered by houses. Of the temple’s five gajurs (pinnacles), the one at the center is gilded and slightly taller than the other four. The gajurs are covered with straw mats during monsoon. The two storey temple has an overhanging roof made of copper that leans on wooden struts slanted outwards. Figures of different deities are carved on each of the struts. Two multilayered light stands and, between them, a pillar with the life size statue of Bandhu Datta Bajracharya stand in front of the temple. Bandhu Datta Bajracharya is the shaman, summoned by King Narendra Dev, who brought and installed both the deities in the temple. While others can pray and worship, to date, only Bajracharya Newars are allowed to carry out the rites at the temple. The front door leading into Karunamaya’s sanctum sanctorum is open only during mornings on normal days. To see goddess Sankata, on the top floor, you enter from back and climb up the wooden ladder that ends right at the door to the sacred chamber. extends towards the unseen face, while legs hang from the mouth of two dogs (some say wolves) at the bottom. One of the Bajracharya priests suggested that the frames represent a crematorium. Since Sankata’s rites are based on tantric principles, the presence of a crematorium becomes pertinent, even if it is in the form of a representation. Hindus offer prayer at the temple every night of navaratra (literally, nine nights)—when nine forms of goddess Durga are worshipped. Navaratra falls in the month of October, and every year Hindus swoop in around Durga’s temples to seek her blessings. The temple of Sankata swarms with devotees at this time as the goddess is considered an avatar of Durga. Every Saturday people wait in a long cue at the temple just to see or offer a short prayer to the goddess. When Shani (the planet Saturn) and Rahu cast their inauspicious shadows on people’s life they get embroiled in difficulties. On the day of Saturn (Saturday) or Shani (Shanibar, the word for Saturday in Nepali) people, particularly those under Shani’s influence, worship the goddess, as she is believed to stave off dangers from lurking near her devotees. The word ‘Sankata’ is derived from a Sanskrit word ‘sankat’ meaning ‘plight’. Sankata, therefore, implies someone who eliminates plight. With the legend that says the goddess resolved the problems of a King and a Shaman, commoners have good reason to worship her, to keep their troubles at bay. She is also called by many other names, including Ambika, ‘mother’. In the form of Parvati, she is known as the divine spouse of Lord Shiva and is the mother of two sons, Ganesha and Karttikeya, and daughter Jyoti. As the Destroyer of Demons, she is worshiped during an annual festival called Durga Puja. A famous form of the goddess Durga, the Goddess of Kalikasthan, is also paid homage during Dasain. The temple is located at Kalikasthan at Dillibazar (in downtown Kathmandu). The temple is situated on the upper storey of a house. The priests stay on the ground floor whereas the goddess’s abode is upstairs. This Kalika is considered to be one of the most respected of Kali’s power centers. Every Saturday and during the Navaratha (Dasain), there is high number of visits to the goddess. She is not without worshippers on normal days either. It is said that when Kaushiki Devi was produced from the body of Parvati, her body was transformed into black, thus the name Kali., the ‘black’ one, was given. Since 1900 on the Nepali calendar (1957 AD), the Maha Shakti incarnate and the descendants of Shiv Kali’s priests (pujaris) started from Harka Bahadur Shrestha (a Newar) who came from Thimi, near Bhaktapur. His only child, a girl named Krishna Kumari Shrestha, married a boy named Man Bahadur Khadka, a non-Newar. Presently, their descendents are the main priests of the temple. Kush Khadka and his wife Sabitri Khadka and their children Kishan and Kiran Khadka look after the temple. According to ancient writings in the Vayu Purana and Mahabharata, Bhadrakali came into being by Devi’s wrath, when Daksha insulted Shiva during the great Ashvamedha Yagna (Horse Sacrifice). According to Tantra Rahasya, she arose from the north (Uttaramnaya) face (Amnayas) of Shiva, which is blue in color and with three eyes. It is believed that Bhadrakali was a local deity that was assimilated into mainstream Hinduism, particularly into Shaiva mythology. Sometimes she assumes a terrible aspect, and is represented with three eyes and four, 12 or 18 hands. She carries a number of weapons, with flames flowing from her head and a small tusk protruding from her mouth. Bhadrakali temples are found both in India and in Nepal. In India they are located at Hanamakonda (Warangal) in Andra Pradesh, at Bhadran in Gujarat and at Kurushetra in Haryana state. Nepal’s Bhadrakali temple is located at the eastern edge of the Tundikhel, near Shahid Gate. This temple is also known as Lumarhi Temple and is one of the main Bhagavati temples of Kathmandu city. Bhadrakali also known as the ‘Gentle Kali’, an auspicious form of the goddess Kali. 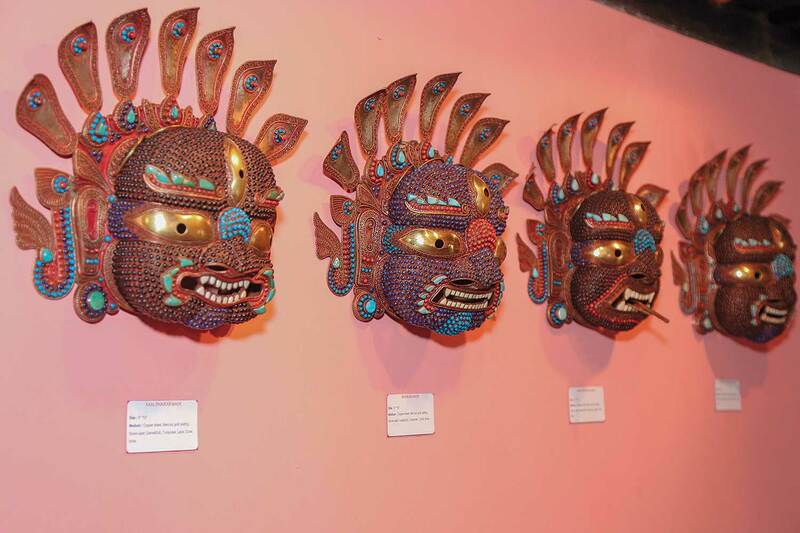 Bhadrakali is also known by the Newari people as Lumarhi Devi, from lumdi in Newari, meaning ‘golden bread’. According to mythology, in ancient days a farmer used to plough some nearby land and had his food (bread) placed on the side. Because the food turned into gold so the temple is known as Lumdi/Lumarhi Devi’s temple. According to one local myth, in the 7th century a tantric practitioner named Saswat Bajra went to Kamaru Kamachya, in India, and worshipped Shri Bhadrakali. He made the goddess happy and brought her back to Nepal in a holy water pot (a kalash). 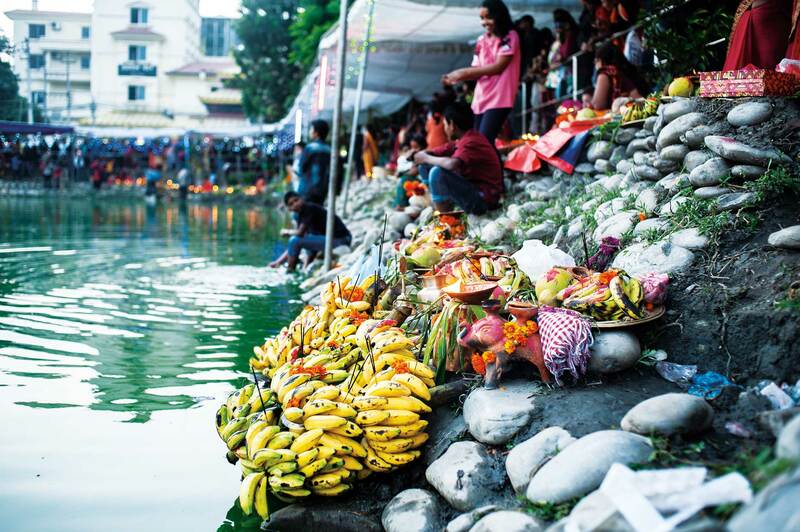 He hung the kalash on a tree at Jamal, on the north side of Rani Pokhari, and went to run some errands. But Kalika took the form of a small girl and walked away. A farmer met her on his way to the field. He questioned her, but instead of answering she fell asleep at the same spot. So the farmer went his way. When he returned, he could not find her, but saw the incarnation of Kalika instead. Then, Saswat Bajra came along and also saw the goddess. After that, the place was established as the temple to Bhadrakali. Many refer to Bhadrakali as Baisnavi Devi. Placed in an open place, the north wall has statues of a lioness, Kumar, and Ganesha. The west side has Bahari and Byaghrini, and on the south are the statues of Bhairav, Bishnu and Kumari. Upon reaching the temple premises, there is a shrine dedicated to Lord Ganesha, which devotees circle before paying their respects to the Devi. The other name of Bhadrakali is Lazzapith. King Ratna Malla started the Astamatrika together with Bhadrakali Dance which takes place here every 12 years. On April 10 each year there is Bhairab Bhadrakali Jatra (festival). Likewise, during Ghode Jatra (the ‘Horse Festival’, the horse racing day on the nearby Tundikhel), which falls in the month of March, and during Dasain each October, devotees crowd into the temple. It is said that in the olden days the Kings of Kathmandu used to go to worship at the Bhadrakali temple in a courtly cavalcade following Kumari, the Living Goddess. Located at the center of the Naxal township in the vicinity of Pashupatinath, Dillibazar and the Narayanhiti museum, sits the temple of Naxal Bhagwati. Sited at an intersection, the temple stands erect and distinct despite the encroachment of nearby shops, concrete buildings and busy traffic. It never fails to draw devotees who keep moving in and out of the temple all day. The features of Naxal Bhagwati are remarkably the same as other ‘Devi’ (goddess) temples—its’ three tiered roof, two of which are copper plated, and carvings of other deities surrounding the temple. The history of Naxal Bhagwati dates back many centuries to the year 1050 of the Kaligat Sambat, when Bikram Kesari was the king of Nepal and his wife Navasagar handled the country’s administration. The queen was greatly impressed with a grand idol presented by one of her subjects. She founded the temple and named the idol after herself: Navasagar Bhagwati. It is believed that the priests and mystics of the time had laid a solid foundation of the temple through tantric rituals and mantras so as to empower the goddess. The intention of the priests was to fulfill a belief that any ritual performed in the temple with exact method or bidhi would be accomplished. Gradually, the power of the goddess increased to such heights that her idol began to emanate strong radiations that were deemed catastrophic. In 665 BS (607 AD), King Shankherdev placed the idol inside the temple and covered it. Then he established another statue replicating the original one and initiated a chariot procession or jatra on the day of Preta Chaturdashi (chaturdashi, the 14th day of the lunar fortnight) to commemorate the ceremony. It is still celebrated every year by the name of Khat Jatra on Preta Chaturdarshi and lasts for three days. Situated to the south of Basantapur near the intersec tion of Chettrapati is the temple of ‘Nardevi’. Despite a line up of other temples in the locality, Nardevi is easily distinguishable.The three tired structure with one of the roofs plated in gold and its crafted pillars identify the Nardevi Mandir. According to historical data, the temple is believed to have been established in the 9th century AD by Gunakamadev, the founder of Kathmandu. There are myths and legends associated with the temple that talk about its origin and the practices carried out there. One such account suggests the temple was discovered by one of the Kings of Patan while visiting Kathmandu on a hunting trip. Later he separated from his group and got lost in the forest of Kathmandu, then known as ‘Kantipur’. When he reached the present day Kilagal he was chased by a wild elephant and upon trying to escape he reached the place where Nardevi temple now stands. The place was occupied by a huge tree then and the king hid behind it, and had fainted there. As he awoke the goddess Swetakali appeared before him and granted his life back by saying “You may live.” The king then returned to his kingdom, and gratified by the incident, erected the Nardevi temple. It is believed that two other two kings of Bhaktapur were visited by the same goddess, which led them to renovate the temple and establish a committee for looking after it. One of the kings also started the ceremony of lighting ghee lamps and sacrificing a sheep. This ritual is carried out by the Kumhale clan of potters from Thimi (Bhaktapur), to commemorate the goddess. The main deity of Nardevi is Swetakali (from sweta or ‘white’ combined with kali, ‘black). The Swetakali is also called ‘Neta Ajima’ by the Newars, while some inscriptions refer to the goddess as ‘Detteswori.’ Nardevi is also considered to be a mother of the goddess Kumari Chandeswori Bhagwati and legends claim that human sacrifices were conducted at the temple. The temple houses three silver statues of Kali and the locals believe that the original home of the goddess still exists in the area, which is called Byachen, literally ‘god’s house’, where all her ornaments and clothes are secured. The ‘Nardevi’ is considered to be a powerful deity of tantric rituals. On the tenth day of Dasain, Khadga Jatra is celebrated to commemorate the victory of good over evil. Different kinds of swords (khadga) are taken to the temple in a grand procession and revered with traditional tantric rituals. The sacrifice of buffalo, slain in a single blow, marks the event of Nawami, the 9th day of Dasain. Dakshinkali is 18 km south of Ratnapark, Kathmandu. The ancient Kalika temple is to the south of the capital which some believe is why it was named Dakshinkali (dakshin means ‘south’ in Nepali). The Dakshinkali temple dedicated to Kali, the fearful form of Lord Siva’s consort, Parvati. The myth is that in the 17th century an oracle spoke to King Pratap Malla in the form of a dream, to establish a temple for the goddess. It was said that this would bring him prosperity and that no epidemic would befall his subjects. The king deciphered the omen and the temple was erected. The main deity in the temple is a black, six-armed stone sculpture of Kali, standing on a prostrated figure. The shrine is especially crowded on Tuesdays and Saturdays when animal sacrifices are offered to the deity. The animals sacrificed must be uncastrated males. Devotees who cannot afford to sacrifice a goat, pig, lamb or water buffalo will offer a less expensive chicken or duck, or even coconut or other fruit. The Dasain festival in October is a major festival here. The main priest performs the ritual praying with the use of left hand. “Because we are a big family, the goddess is worshipped by the priests in rotation. The main pujari (priest) is changed every month,” says Rajesh Karmacharya, one of the priests at Dakshinkali. The morning ritual is conducted at 12 o’clock noon for an hour. Until the puja is complete the pujari is on fast and cannot have anything, not even tea. After the sun sets, an evening puja is done for 10 to 15 minutes. Men of the Deula, Karmacharya, Maharjan and Pode Newar castes look after the functioning of the temple. They are appointed by the Guthi Sasthan (temple management association). The offering, be it money or otherwise, is equally distributed amongst the four groups. Seven male goats, three sheep, one ox, and two ducks are offered twice annually during Mahapuja (literally ‘The Great Worship’) to the goddess. The tradition of animal sacrifices that prevails here is on the lines of the Tantric scriptures. Kali temples reverberate with extraordinary stories of tantriks and their devotion to the goddess. Bidya Nath, a retired Dean of Tribhuvan University and Rector of the Sanskrit University in Kathmandu who has also edited Tantra Chintamani and written many articles on Tantra, says that “Tantra Shastra, also called Agama, was recited by Shiva, heard by Parvati (his consort) and accepted by Vishnu. Shiva was the origin of this knowledge. Tantra is a lifestyle, the main goal of which is salvation of one’s soul,” he goes on. “Tantra says God exists everywhere. It inspires one to live a pure life and leads one to the realization of the self as having a separate existence from one’s body. A true Tantrik knows no fear. To practice Tantra, one has to take diksha (which means knowledge in the Nepalese language) from an accomplished teacher. Diksha is provided to boys in a group when they are of age. For Hindus, 32 lachin is a trait that holds great significance . It is be lieved that there are 32 attributes to perfection, emphasized mostly on women, leading to prosperity and luck. The name ‘Shobha’, in the same regards, means ‘brilliance’ (derived from Sanskrit) or someone bestowed with ‘32 lachin.’ As the name suggests, Shobha Bhagwati, is believed to be a goddess of perfection and brilliance. One of the myths of the Shobha Bhagwati temple says that the place was covered with dense forest before it was constructed, and that a particular spot in the forest, a place made out of few stones, radiated immense light. 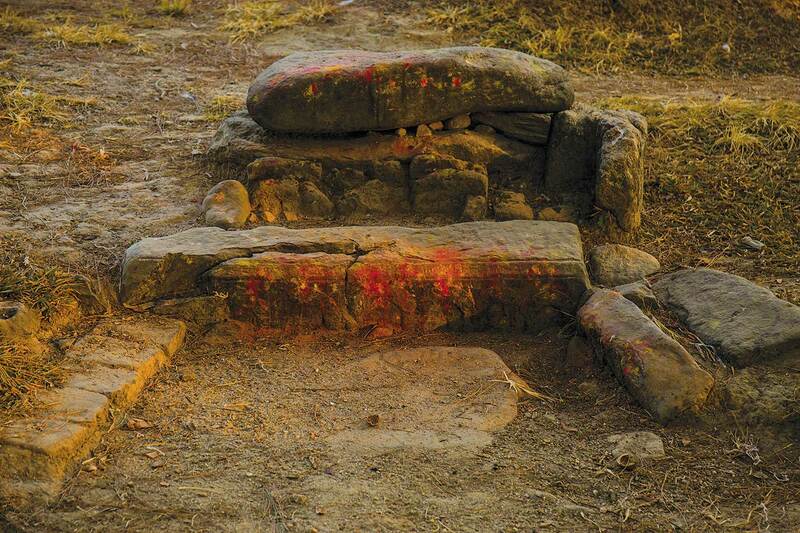 Nearby residents came and worshipped the site and called it “shobha” referring to the light or ‘brilliance’. The Bishnumati river by the side of the temple was regarded as ‘Baytaal’, the goddess’s protector or guard, and devotees bathed the goddess from its water (jaal). It was later, sometime between 1000 and 1050 of the Kaligat Sambat (era), that queen Navasagar established the goddess’s idol and constructed the temple. It is also believed that the goddess Palanchowk Bhagwati, Naxal Bhagwati and Shobha Bhagwati are sisters, with Palanchowk Bhagwati being the eldest. The artisan who crafted idols of all the three Bhagwati was said to have had his hands cut off after the completion of his work, thus rendered unable to surpass this particular creation. The goddess Shobha Bhagwati is considered to be very powerful in fulfilling the wishes of her devotees. The temple is a three-tiered structure with copper roof, and has all the forms of Durga enshrined in the temple’s periphery. Prominent deities such as Agala Mukhi, Bagala Mukhi and Jwala Mukhi are placed within the body of the main goddess. Devotees throng the temple during Dasain and sacrifice animals on ‘Nawami’, the ninth day of Dasain. Among the sacrificial animals are water buffalos, goats, ducks, hens and mountain goats (called chyangra). during other rituals. These deities are brought to the Shobha Bhagwati temple from their original site with grandeur and returned with the same grandeur the following day. Gyani Guruju is the official priest of the Shobha Bhagwati temple, whose family has been performing its rituals for the last four generations.